Yesterday’s news that a Stockport man is being held as a co-conspirator in a goofy-but-grotesque terrorism plot leaves Columbia County residents wondering: Who is Eric J. Feight? Many people leave extensive traces of themselves online, but Feight’s web presence seems relatively slight. The highlighted photo above—found in a 2013 newsletter of the Kinderhook Elks Lodge #2530—is one of the only photos of Feight uncovered after an extensive web search. Feight is listed as the Lodge’s “Leading Knight,” evidently the #2 position in the group. Feight is, of course, innocent until proven guilty; and most experts seem to think that the crackpot device he and Glendon S. Crawford (reported to be a Tea Partier and KKK wannabe) allegedly sought to construct would not have actually worked. 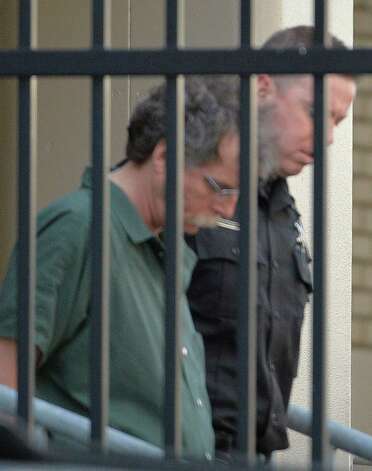 The mustachioed and slightly-graying 50something man above appears to match a grainy photo of Feight being arraigned yesterday, published in the Times-Union. Engineering Manager - MCSE - Microsoft Certified Systems Engineer - Has over 19 yrs. experience designing control systems. Projects Include: Water & Waste Water Treatment Plants, Material Handling, Conveyor Systems, Extrusion, Coordinated Motion Machinery, High Speed Sorting Systems, Paper Processing. Software Experience: Cimplicity HMI, SQL Server, Access, Intouch, Texas Instruments, Red Lion, Emmerson, Allen-Bradley, Honeywell, PanelView, GE Fanuc, Quick Panel, Intellution and API. Feight is listed currently as Vice President of a company called Genius Industrial Solutions. GIS’s website gives no physical address, only phone and email contacts; but other records indicate it is located in Cobleskill. Feight and GIS are included on a Hudson Valley Community College list of companies interested in hiring HVCC grads. So, I mean I, I, I have to admit having never been involved in anything like this before, you know, at first it made me a little bit nervous...I don’t want to say apprehension, but nervousness about how much involvement I was gonna get in this kind of got outweighed, uh, quickly with, you know, when I started seeing how things, the direction things were going and then certainly after the elections. It's like well, ok, you know, that old saying is right. You know, the only thing necessary for evil to triumph is for good men to do nothing. Feight left this question on a technical message board, looking for advice for getting a DRPAM interface to work. (No one replied.) It’s not clear whether this had anything to do with the control device he is charged with building for Crawford. Feight is, of course, innocent unless proved guilty beyond a reasonable doubt; and in any case, most experts seem to think that the device planned was more fantasy than reality. With news breaking of a bizarre terrorism arrest with connections to Columbia County, one can’t help but to wonder: What is it with the Route 9H corridor? In a previous report, this site referred to a four-mile stretch of 9H as “Fire Alley,” with a series of major fires in just 2.5 years. Five fires on 9H during this period included the May 2010 blaze which leveled Amanda’s Fireplace on 9H, between Falls Road and Falls Industrial Road. That fire was deemed an arson by investigators, though no one was ever arrested. Columbia County issued a $2.5 million stimulus bond to assist Amanda’s with rebuilding. Just a stone’s throw from Amanda’s Fireplace on Falls Industrial Road one finds TCI of NY, the PCB handler/processor whose facility was devastated by a September 2012 fire. That inferno (and the overnight sequence of explosions) caused an evacuation of neighbors, with all residents within 15 miles told to stay indoors and turn off air conditioning for the day. As also previously reported here, two additional fires (for a total of seven) occurred just a couple miles off Fire Alley in recent years, on nearby Knitt Road along the border of Ghent and Stockport. A January 2008 structure fire at 28 Knitt Road forced a woman to jump from a second-story window to safety; and then a July 2011 barn/shed fire at 16 Knitt Road. Knitt Road turns into Falls Road as it heads east, coming to a T at Route 9H—the epicenter of Fire Alley. And now, stories are breaking of the Federal complaint charging one Eric J. Feight as an alleged co-conspirator (with Glendon S. Crawford) in an outlandish plot to irradiate Muslims with a homemade X-ray device. Feight is listed as a registered Conservative in Columbia County Board of Elections records at 115 Knitt Road—several houses down from the barn and structure fires of 2008 and 2011.
formerly worked as a computer software expert and “project engineer” for Smith Control Systems... A company official said Feight has not worked at the company since 2010. Where is Smith Control Systems? Right next door to Amanda’s Fireplace on 9H. Smith Control is #1839, and Amanda’s is #1869. Coincidence? Almost surely. (It should be noted, Mr. Feight and his accomplice are, innocent unless proven guilty beyond a reasonable doubt.) That said, it continues to amaze how consistently one isolated area of a rural county manages to generate both news, and trouble. FEIGHT has designed, identified and received needed parts, built, and successfully tested a working remote initiation device to remotely control an industrial x-ray system - which CRAWFORD later demonstrated - and that remote initiation device is powered by a plug-in cigarette lighter electrical source, consistent with CRAWFORD's requirement to put the whole system into a truck so that it can be used against human targets. FEIGHT is aware of CRAWFORD's plan that the remote initiation device be used to remotely control an industrial x-ray system to injure or kill human targets deemed undesirable, and, on November 14, 2012, FEIGHT met with CRAWFORD, UCE #2, and UCE #3 near Albany, NY to discuss the purpose of the project, assign tasks, and confirm his capability to design and build a remote initiation device. CRAWFORD and FEIGHT both have used the phrase "sterilize medical waste" to refer to the harming and killing of human beings, and stated that the purpose of their device is to kill human beings. From time to time, however, they each have expressed a reluctance to be the one who actually triggers the device to kill. A Columbia Paper article published late last night reports that a second grand jury convened to consider City Hall burglary charges brought by District Attorney Paul Czajka against former Alderman Quintin Cross and resident Jamont McClendon has declined to issue an indictment. According to one legal expert, that would imply that the judge assigned to the case agreed to dismiss the original grand jury indictment, while allowing the D.A. to take a second shot at a new grand jury. Such a step likely would have be taken by the County prosecutor in order to correct issues that arose with the Hudson Police Department not providing both his office and the defense with a complete set of evidence—including a reported videotape from City Hall from the night of the March 19th break-in. However, if judge Jonathan Nichols had issued such a ruling, it had not become public knowledge despite the intense publicity that the case had attracted. A trial had been expected this Fall, prior to the evidence SNAFU, which gave his attorney Susan Tipograph grounds to get her client released pending trial. The pair’s saga has attracted widespread news coverage both locally and in the region after the HPD issued a bulletin that they were seeking Cross and McClendon for questioning in relation to the break-in. The two then disappeared, with the latter apprehended in Hudson on April 3rd, and the former turning himself on April 30th, nearly six weeks after the police bulletin. It is still unknown where Cross was staying during that period. According to a Register-Star report in August, the missing evidence included “a DVD of the Hudson Police’s interview of Cross, a CD of more than 100 photos from the crime scene and stills from the City Hall surveillance camera showing two suspects entering the building.” Judge Nichols “summoned” HPD chief Ellis Richardson and Detective John Funk to deliver the missing materials, considered at the time crucial to the case. That case eventually resulted in a larceny plea deal, with various community figures pleading for leniency. But parole violations caused Cross to spend two years in jail, rather than just than his initial six months’ time served. Judge Nichols rejected his attempt to void the sentence on procedural grounds. Questions also arose (for example, on CBS6) about the Hudson Police interviewing Cross voluntarily on the morning after the burglary was discoverd, but then deciding not to hold him shortly before his disappearance and the issuance of the bulletin. CBS6 in Albany (Channel 6) is reporting that a 54-year-old Queens man on parole who has been living in Hudson has been arrested and charged with this week’s robbery of the Bank of America in Hudson. Scott Baldinger has a breezy account of being on Warren Street in the wake of the robbery at his blog. 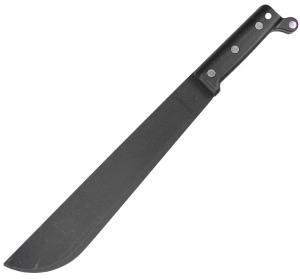 Am I the only one in Hudson not carrying a concealed machete? Two incidents at the end of May make me wonder. Driving in the 800 block last Thursday night, two men wandered into the street and wouldn't budge in response to the car horn. One then pointed an object—roughly 1.5-2 feet long and later identified by a source as a machete—at the other. At this point a U-turn back up the block seemed the wise move. This source later reported that a fight ensued, with the machete man going up against another with a 2 X 4, possibly over a domestic dispute involving a woman and a child. In this version of events, the two replicated that familiar movie sequence in which two boxers or Western desperados take each other out simultaneously, with both the machete and the 2 X 4 guy swinging and taking the other down. In any case, by the time I’d skirted the block and returned farther south on Warren, several police cars had arrived. This comes on the heels of a somewhat confusing crime report in The Register-Star also involving a machete-wielder and a gunman. Shots were apparently fired at the machete man, missing a crowd of people at 5th and State on the afternoon of the previous Monday. But eyewitness reports disagreed about who was the aggressor. Only one of the two was arrested initially, according to the paper. Was the first incident above a continuation of the second? How do you conceal a machete in your pants leg without incurring embarrassing self-injuries? Does Hudson have an inordinate amount of underbrush to clear, spurring people to buy machetes—which later become weapons of opportunity? Or do residents keep machetes lying close by just in case they spot someone with whom they have a beef? Buried amid the news breaking this afternoon that Quintin Cross has surrendered to authorities—six weeks to the day since his disappearance—is an interesting tidbit: Cross is being represented by New York City defense attorney Susan Tipograph. Tipograph’s legal resumé includes clients deemed by some to be political prisoners, for example a member of the Weather Underground. Operating in some of the same territory as the celebrated William Kunstler, her causes are more likely to be covered by publications such as The Village Voice and The Nation than in the pages of The Register-Star. This leads to the conjecture that Cross conceivably may have connected with Tipograph through someone involved with TSL. Among other connections there, Cross was photographed blowing kazoos on the steps of City Hall with TSL directors Linda Mussmann and Claudia Bruce less than two weeks before it was burglarized. Was Cross in touch with TSL or its directors during the six weeks he was missing? Or, as his recent Facebook postings** about social justice might suggest, did he just happen to find Tipograph on his own? * ... Though she did recently represent a woman charged with scamming an elderly man with dementia out of his money.